Welcome back to our Ethical Living Guide blog series! If you missed part 1, you can read it here. Now in Part 2 we focus on putting all that you learnt into action! Walk the talk, put your money where your mouth is, follow through, so-to-speak. The focus of course, is donating. It’s a choice for you to make a sacrifice in your life and support a cause you believe in. It is also a way that you can make a tangible difference in the lives of those who are exploited. It’s about taking action and playing your part in the broader picture of making the world a place of freedom, hope and safety. Honestly, this is not just a fundraising strategy for The Freedom Project. Although we are dependant on donations to do what we do, we are equally as interested in raising up Freedom Advocates who are living lives holistically in pursuit of freedom and ethical living. By giving and fundraising, you are contributing to making the world a better place. As an organisation, we are simply the conduit through which you as an individual are making change and bringing an end to slavery, one life at a time. Your donation will help us continue our life-changing work across the world, as well as keeping operations running locally in Australia. Did you know that over the last few years, we have been able to impact thousands of lives through our field projects? We are hugely thankful for each and every donation that we receive and we do our best to be good stewards of what we receive. According to our last 2 years of financial reporting, almost 90% of all funds received go straight to the field! All donations $2 and over are tax-deductible. You can donate online or deposit directly into our account (email us for details). A very simple and effective way to raise funds for The Freedom Project is through our Coffee Money Mondays campaign. 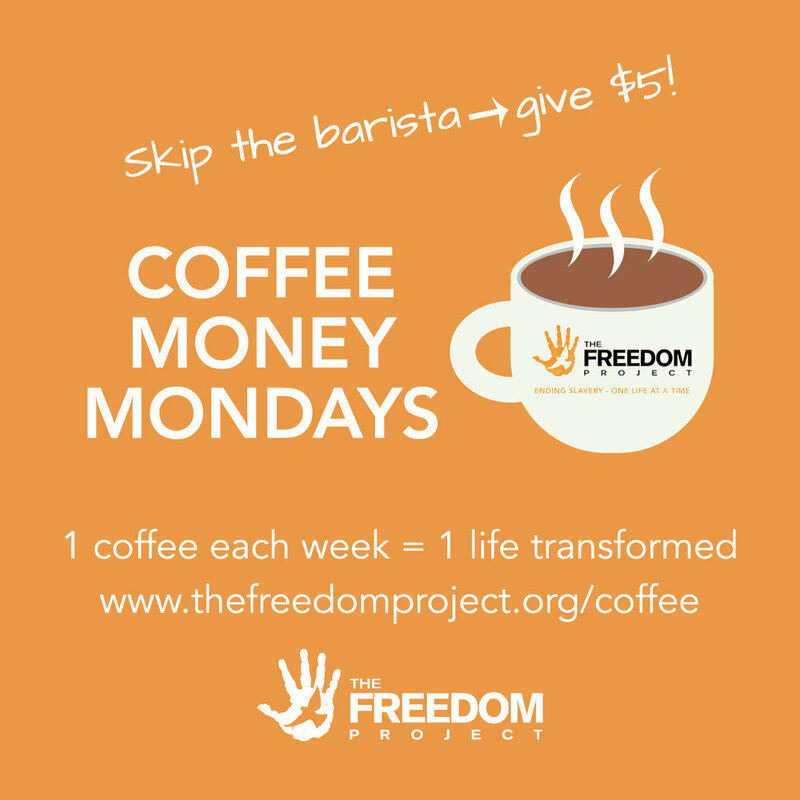 People choose to give up their Monday coffee and donate the $5 to The Freedom Project instead. The $5 you donate is the equivalent of what it costs to keep 1 child in our sports and mentoring program in India, a highly fruitful program reaching over 900 vulnerable kids. Coffee Money Mondays is a weekly (or monthly) commitment, where people can choose to give the equivalent of 1 coffee per week, or more. You can join but also we would love you to get your friends, family or people at your community group to join. We are hoping to reach 1000 Coffee Monday Mondays Partners – will you be 1 of them? We are small organisation but are kept going by an amazing group of about 60 monthly donors – known as Freedom Partners. By committing to monthly giving, your regular support will enable to us to consistently support our projects overseas and help us budget for bigger impact. You can become a Freedom Partner by signing up to give monthly, of any amount. After your first gift which will be taken when you sign up, you can choose what date of the month you prefer to give. You can alter or cancel your gift at any time. Please note that all funds will go where most needed. What impact will your regular support have? The following dollar handles give an indication of the type of impact your dollars will have. It could be the perfect opportunity to raise some funds for The Freedom Project. Whether it’s a birthday, anniversary, wedding or other special day, you can ask guests to make a donation instead of bringing presents. You can collect cash, point people to our website, or set up your own fundraising page through Everyday Hero or GoFundraise. The choice is yours. We would love to help by providing any information or resources that would help your guests know who they are supporting. Contact us for more information or to let us know that you will be raising funds for us so we can celebrate with you! Stay tuned for our Ethical Living Guide blog series part 3 - coming soon! The focus is: ACT, including great practical ideas on how you can spread the word about trafficking, slavery and fighting for freedom around the world.